Although I’m sure some people will think this is just a picture of a little dog laying down, those of you who have dogs might be able to recognize the signs of a dog freaked out of his little gourd. 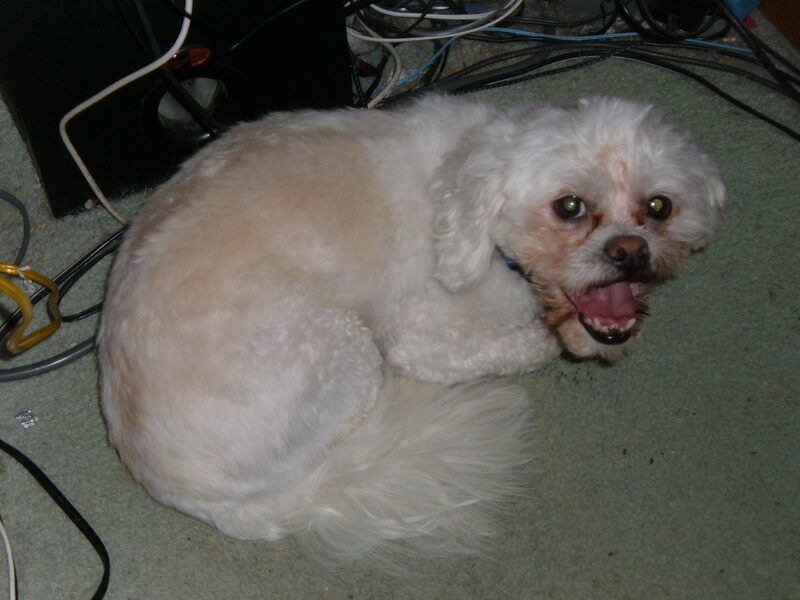 This is a picture of Bailey hiding under my desk, curled up into a little ball with his tail tucked in and shivering. What catastrophic event caused Mr. Bailey’s distress? Lightning storm? Hurricane? A nationwide Carrot Top comedy tour? No! It’s “Sgt. Pepper’s Lonely Heart’s Club Band” being played on The Beatles Rockband. Incidentally Bailey started reacting to the game shortly after I read the trivia about how an ultrasonic sound, like a dog whistle, was added into the song Inner Grove on the album, though that song isn’t present in The Beatles Rockband. It wasn’t just Sgt. Pepper that scared Bailey though, he showed equal fear to “Here Comes the Sun”, “Octupus Garden”, “Get Back”, and every song in between. I guess something about the Beatles’ later years really frightens the poor little dog. After playing the game I ended up having to spend the next hour consoling the poor little dog that the big bad Paul McCartney wasn’t going to get him. Well, at least the game was loads of fun. Guess it’s a good thing for Bailey it was only a rental. This entry was posted in Home Life and tagged Beatles Rockband, Blog, Dogs, Pictures, The Beatles, The Beatles Rockband, Video Games. Bookmark the permalink.